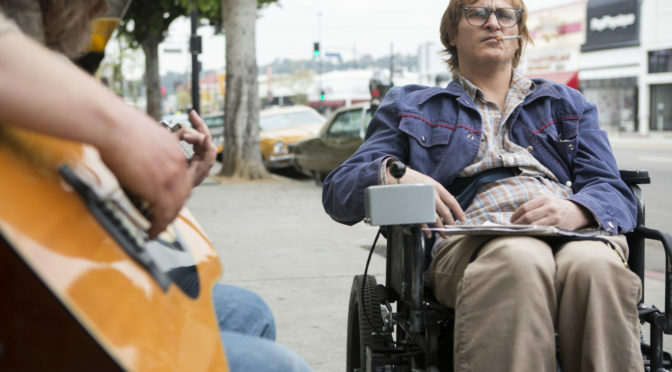 DON’T WORRY, HE WON’T GET FAR ON FOOT tells the story of prolific (and sometimes controversial) cartoonist John Callahan, who became partially paralysed due to a car accident at the age of 21. Following Callahan’s life after this point, the film focuses on his struggle to overcome his alcoholism and connect with the people around him. It features a talented cast, including Joaquin Phoenix (HER, YOU WERE NEVER REALLY HERE) in the lead role. Unfortunately, it is also directed and scripted by Gus Van Sant. Many will remember Van Sant’s moving 1997 work GOOD WILL HUNTING with fondness. They may not wish to be reminded that he also directed the shot-for-shot remake of PSYCHO, where Vince Vaughn was cast as Norman Bates. With this in mind, we might be forgiven for expecting a mixed bag, and that is exactly what we get. Structurally, DON’T WORRY is desperately muddled. It begins with an attempt at a non-linear storyline, with John recounting his tale to different audiences, including a church filled with AA members. Though incorporating flashbacks into this format is not unusual, it’s confusing in this case because Van Sant makes no effort to inform the audience where we are in the timeline (for example, Phoenix’s haircut doesn’t change for a large part of the story, and is thus consistently distressing). This has the result that the first third of the film feels directionless: once we get past the accident, we have no sense of John’s progress. This has the result that the film feels far too long, despite being less than two hours. Frustratingly, the non-linearity disappears after the halfway mark, leaving us to wonder why it was inflicted on us in the first place. Van Sant’s screenplay, too, features a host of lazy creative choices. He rarely shows us character progression in a scene or moment, if a montage or a voiceover could be used to spell it out instead. John’s journey is not left to the viewer to infer – instead it is couched firmly in the dogma of the ‘twelve steps,’ with AA sponsor Donnie (Jonah Hill) present at every turn to explain to us what epiphany is on the horizon next. Important moments are strangely trivialized – at one point John goes through all the people in his life he feels he must forgive, including his adopted parents. (This is apparently a central part of AA dogma.) Despite heavily foreshadowing their difficult relationship, Van Sant glosses over the moment of resolution in a few seconds: John simply crosses ‘Mom & Dad’ off his list as the parents wave like mad automatons in the background. They are out-of-focus. For its inanity, the moment is oddly hilarious, recalling the payoff of Scott’s final battle with Nega-Scott at the climax of SCOTT PILGRIM VERSUS THE WORLD. This effect is probably not intentional. And here’s the rub – the film isn’t terrible. It’s not the only bizarre choice. DON’T WORRY is peppered with narrative decisions which give you the impression that Van Sant has seen a lot of good films and attempted to ape their techniques without understanding the need to follow through. Since the film focuses on past trauma, he makes use of flashbacks to childhood, as in YOU WERE NEVER REALLY HERE. However, these are only used once and do not recur or resolve. The film features macabre themes and a character who muses on their own mortality – therefore John experiences hallucinations of gymnasts who practice in the park and wave to him. This visual metaphor for the call to the afterlife occurs twice, has no resolution and therefore, like the flashbacks, comes across as isolated, unfinished and random. Nowhere else is the inferior cloth of the screenplay more visible than in the use of the actors. We know that the main players are talented performers because they have done good work in the past. And yet Joaquin Phoenix is solid, but largely unremarkable. Jonah Hill (THE WOLF OF WALL STREET) does well with what he is given, but his character is overused and so feels like the preachy embodiment of AA positivity. Rooney Mara (CAROL), portraying Annu, John’s Scandinavian love interest, is most poorly served. Annu seems to exist to do nothing more than validate John and tell him that he is special and beautiful. Her relationship with John informs the audience that he is finally doing well – but she has no characteristics of her own, except bland perfection. On a positive note, the standout performance of the film is Jack Black as Dexter, the man who caused the accident that left John partially paralysed. Black’s appearances are brief, but his performance as a man consumed by regret is truly moving. And here’s the rub – the film isn’t terrible. Sometimes the performers, in particular Black and Phoenix, shine through. There are tiny glittering moments: for example, John’s joy when he first uses an electric wheelchair is truly infectious. In a (crucially) wordless scene, he whizzes around like a maniac, exalting in his newfound freedom. Occasionally John Callahan’s cartoons are incorporated into the story – and you begin to wish you could see more of them. Callahan’s memoir, the bedrock on which the film was constructed, is full of potential. But it is hamstrung by a pointlessly complex structure, a pedestrian screenplay and odd narrative decisions. Every turning point of John’s life, every realisation, is underscored with the sincere wisdom of Donnie (‘Have you forgiven yourself?’) and the swelling of strings. At the end of DON’T WORRY, the camera pans over the faces of ‘those who made it possible for (John) to be here’ – and their faces are upturned and inspired. The music rises, to inform us that we should feel the same. But the film has not earned this. The story is interesting. The actors are talented. But Van Sant, and his screenplay, are unequal to the task.